Aurobindo Pharma Ltd wanted an acquisition that could lift the profitability of its European operations; its earnings before interest, taxes, depreciation and amortization (Ebitda) margin was in the mid-single digits, compared with the company’s overall 24.6% (in the September quarter). Its acquisition of Portugal’s Generis Farmaceutica SA is a step in that direction, with the target firm’s estimated margin at 19.6% in 2016, pegged to increase to 21.9% in 2017. The real benefit of this acquisition can be attained if Aurobindo can drive up its scale of operations and use synergies to lower costs. Aurobindo is paying €135million, or Rs970 crore, to acquire Generis, a generic drug company, valuing it at 2 times revenue and 10.6 times Ebitda. Aurobindo’s debt is likely to increase because of this acquisition. 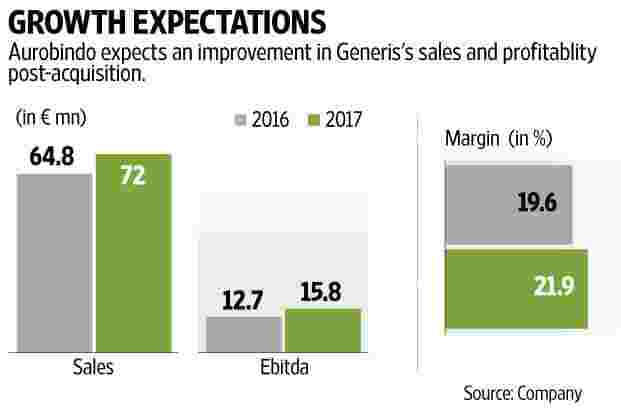 While its margins are good, Generis’s sales growth has been sluggish, growing by 3.3% in 2016 (estimated) and 6.1% in 2015. Aurobindo expects this to accelerate in 2017 due to new product launches and the resolution of supply chain bottlenecks that held back growth in 2016. This is also expected to see profitability improve. At present, Generis has a capacity utilization of 50%, which is expected to improve but also because Aurobindo will use Generis’s Portugal facility to make some of its products for the European market. Utilization is expected to improve to 80% by 2020. This acquisition alone is not enough to boost Aurobindo’s European margins as its European revenues were Rs813 crore in the September quarter alone where Generis’s estimated annual 2016 revenue was Rs465 crore. If Aurobindo’s plans to extract synergies works, that will boost scale and profitability. It has been transferring products from Europe to India to lower manufacturing costs. In its conference call post-September quarter results, the management had indicated that it wants to transfer a total of 114 products, which contribute to 40% of sales, to India. A dedicated facility for Europe will start in January. These developments should give shareholders something to look forward to. Aurobindo Pharma’s shares have been under some pressure in the past few months. One concern is regulatory as the company is being probed for alleged price-fixing by the US department of justice. Aurobindo has said that the product which attracted this investigation had revenues of only $1.1 million. Still, where US regulators are involved, investors are right to show concern. In the second quarter, its results had seen the impact of pricing pressure in the US market and how it crimped sales growth. The US market is twice the size of its European business and its profitability, too, will be higher. What happens in the US market, both in terms of pricing pressure and developments on the regulatory front, is what shareholders will be watching for in the near to medium term. That will influence how its shares perform, rather than this acquisition.